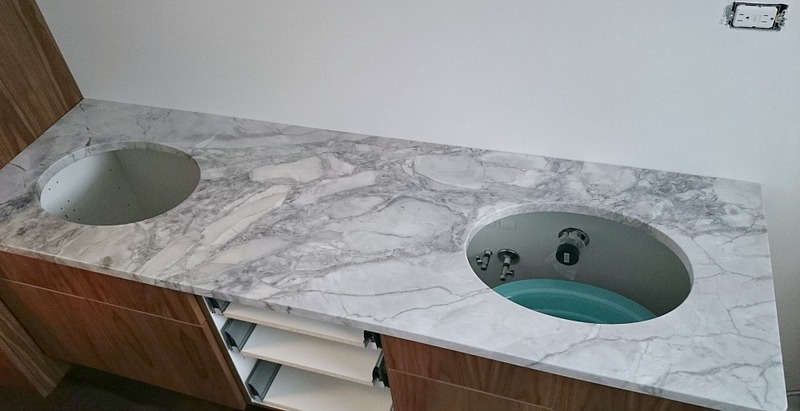 Bathroom Update: Quartzite Counter and Aqua Sinks! 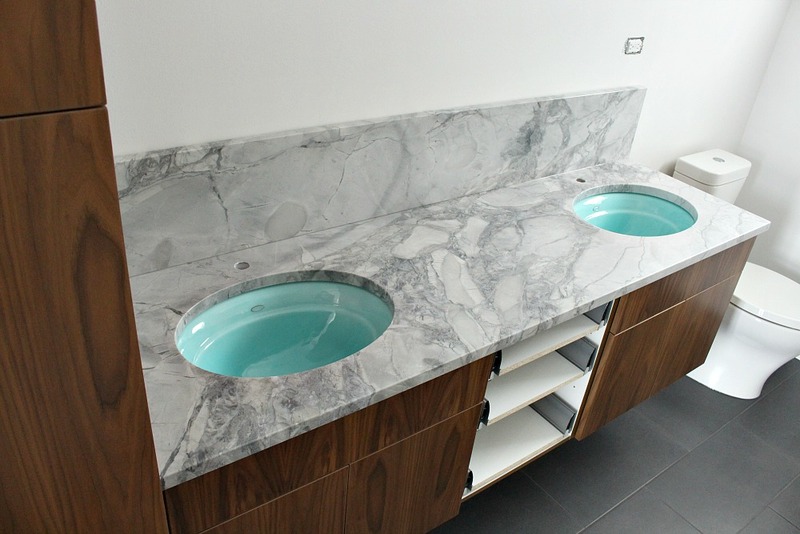 I am excited to report that the quartzite counter and aqua sinks have finally been installed in the bathroom! Nothing has been easy about this bathroom renovation but I’ve decided that all of the setbacks and problems are going to make me appreciate the finished room that much more! Gratitude is my word for 2016. 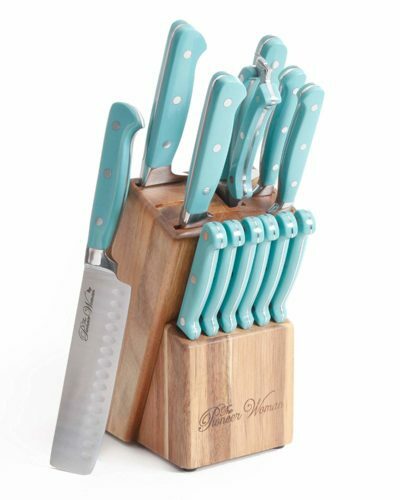 In other news, instead of renovating the kitchen (because who wants to go through this again, on a larger scale? ), we’re buying a boat. Gorgeous, right? I can’t get anything done these days because I spend all my time leaning against the bathroom door frame, staring into the bathroom all googley-eyed. Hopefully the new replacement drawer fronts for the walnut vanity will arrive soon because that’s where my eye wants to wander. Anyway – back to reality! 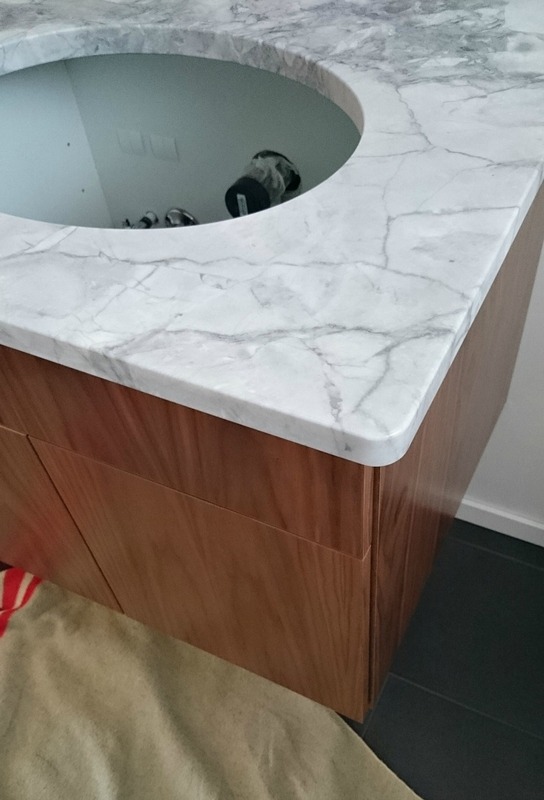 The quartzite counter was originally delivered Monday morning but the second it was set in place, I noticed a problem: the front right corner was really rounded. I had ordered as tight a corner as possible (in other words, as small a radius as possible) and, while the left corner was done correctly, the right hand corner was not. It bothered me so much that they were done differently! Once the slab was back in the shop someone looked up my file and, sure enough, I had requested a 10mm corner but had been given something different (we guess a 20, maybe 25?). I was asked to double check the length of my cabinet and they shaved off some stone from the right side to re-shape the corner (there was a bit of an extra overhang, so they re-cut the corner). Now both corners matched and are as blocky and squared off as possible. We drove into town before they delivered it to double check (something we should have done before delivery the first time). Now the corner is perfect – as sharp as can be before it becomes slicey – but the right side overhang is 1/2 cm shorter than the front and left (which are the same). But the left butts up against the linen tower, so I haven’t yet decided if the difference is noticeable. 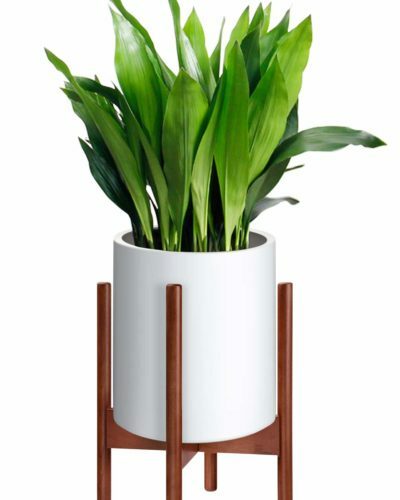 I’m SUPER irritated that it couldn’t be done right the first time because I spent an embarrassingly long time explaining what kind of corner I wanted and pointing to what I did and didn’t want in the showroom – the corner shape was a big issue for me. I’m not always super particular, but that was something I was very specific about. It’s fixed, but the solution isn’t ideal and I really can’t believe they couldn’t pay attention to this one simple instruction when I belabored the point so much. Plus, there might be another problem: we have yet to install the faucets but I’m 99.9% sure that the faucet hole above the right hand sink is off centre by about 1/2″. I’m waiting until we put on the faucets before ringing any alarm bells – it might look fine once the faucet is installed. Fingers crossed! Despite these problems, I love the stone itself and am really happy with my choice. 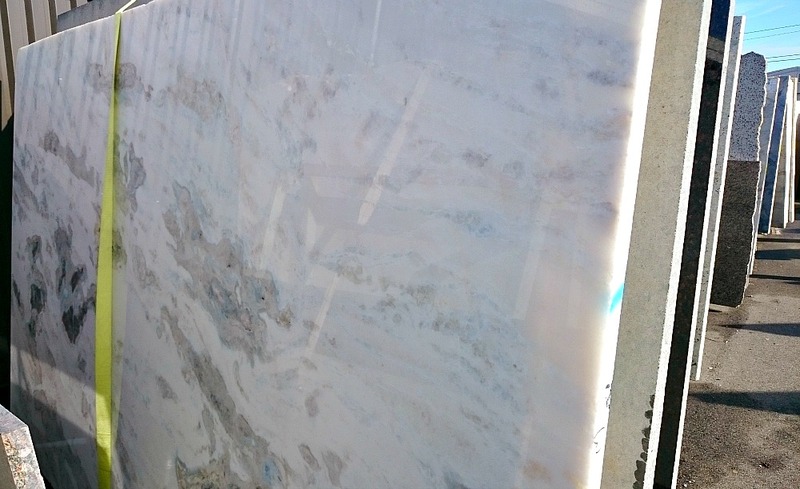 There are so many beautiful pockets of gleaming blue flecks in this slab and the veining is gorgeous. I can’t capture in photos just how luminescent and light reflecting the stone is. It really looks like a frozen lake. There is so much variation in the greys and I love how perfectly the organic quality of the stone pairs with the walnut wood grain (that’s no accident!). 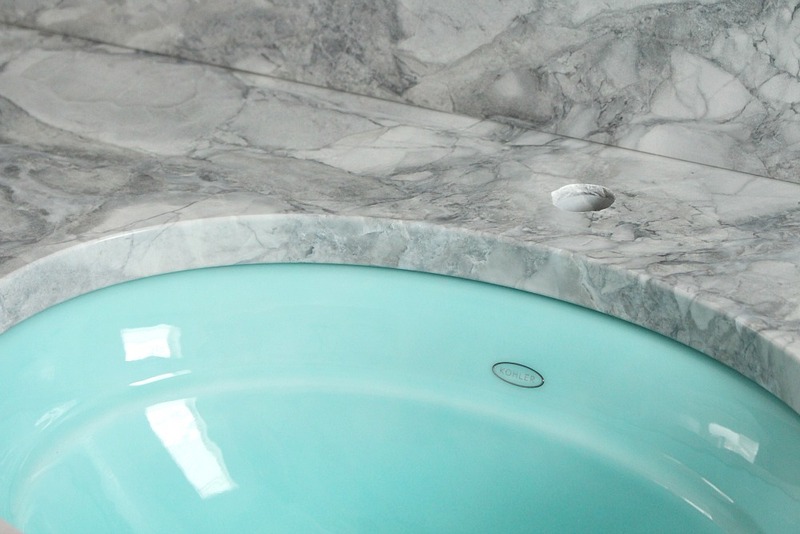 I kept the floor tile really simple to highlight these two elements – and, of course, my dreamy aqua sinks. 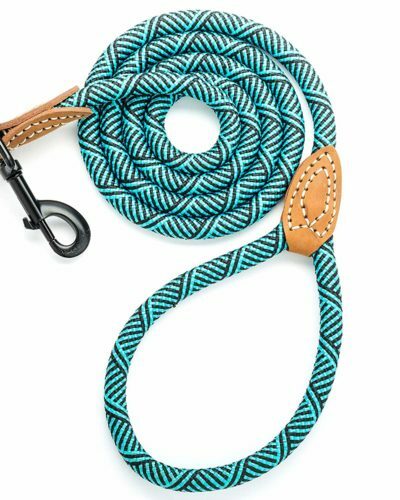 This is the only splash of colour so far and it’s perfect, just a little peek of turquoise. 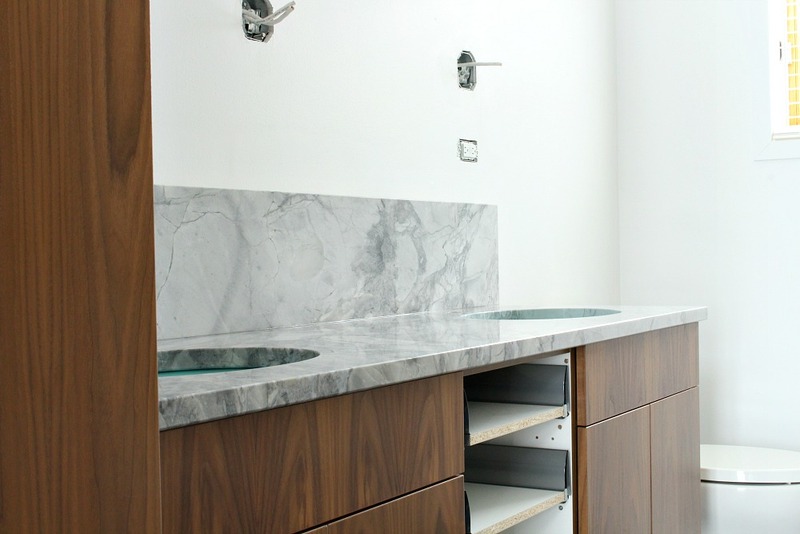 It’s the Serif undermount sink from Kohler, who partnered with me for this bathroom renovation. The colour is “Vapour Green”. 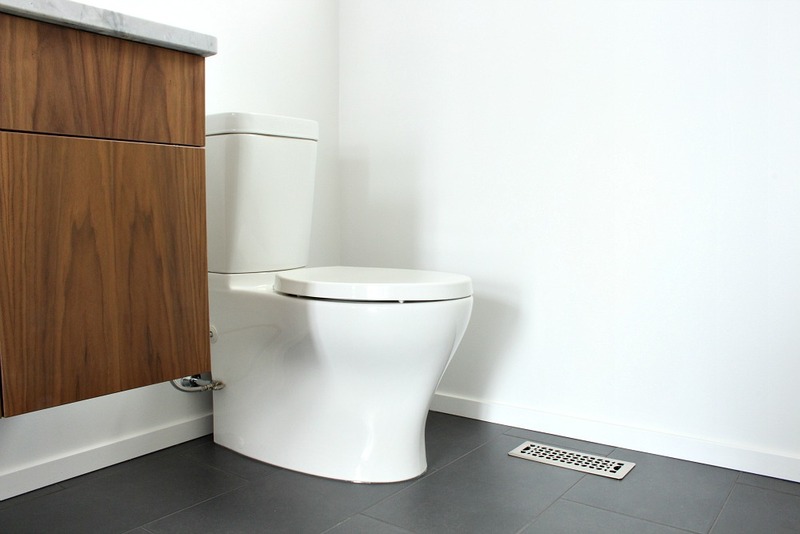 In other news, we finally installed the Persuade Circ skirted toilet (also from Kohler) after sweating over drilling holes in the tile for it. Plus we’re all done installing and painting the trim – which is one of those jobs we usually tend to drag out! I’ll keep you posted on progress, here and on Instagram (where I’ve been sharing sneak peeks). ok those sinks are SO fun! Thanks Cassie! 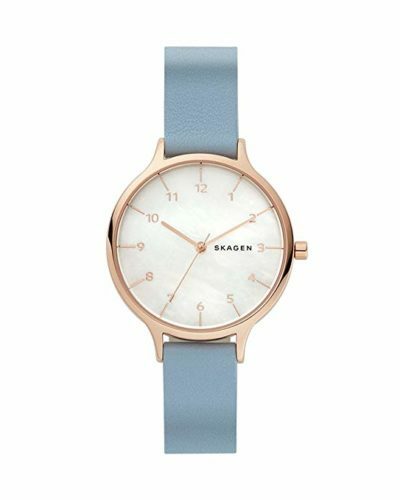 I played it pretty safe with everything – even the accessories I've picked out! – but I HAD to have one hit of turquoise in there. This looks SOOOO good! I love the natural patterns together. Thanks! I wanted a really organic feeling when all is said and done. I love mid-century and bright colours, but I want this house to also feel like it's blending into the landscape. Yes, I'm pretty sure it is. 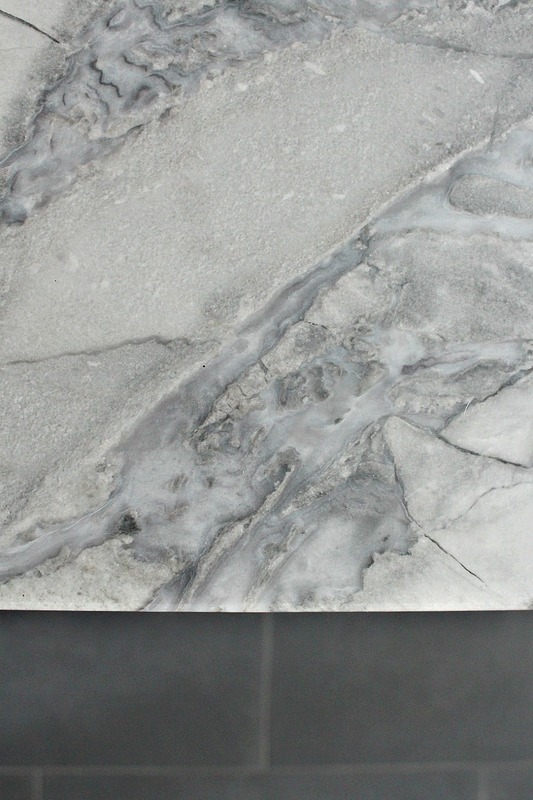 This was called "white fantasy," "fantasy white" and "super white" in different granite stone yards, so I think it's all the same kind of quartzite. 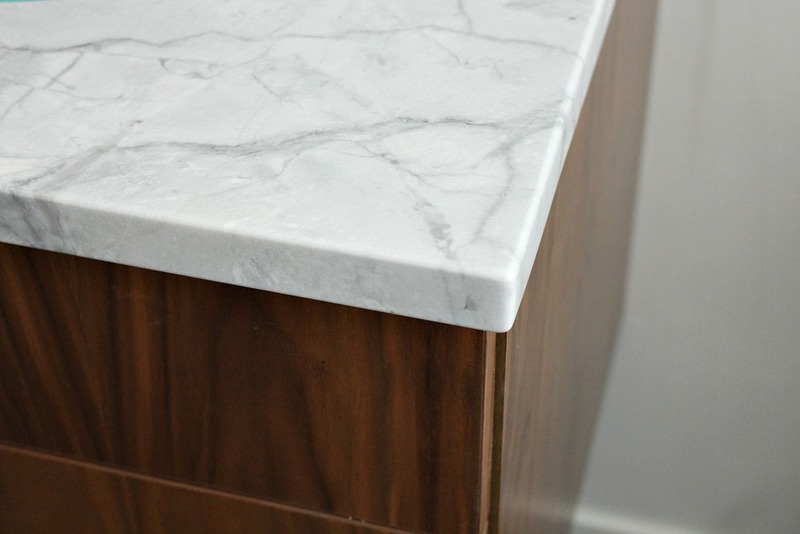 I hesitated with the dark cabinets for a minute, too, and thought about going white with the cabinets or doing an all white quartz counter, but they were all really creamy, anyway. I'm really happy with my choice and so glad to hear you are too. White subway tile with grey grout is such a good way to complement the stone but add a classic touch – good call! 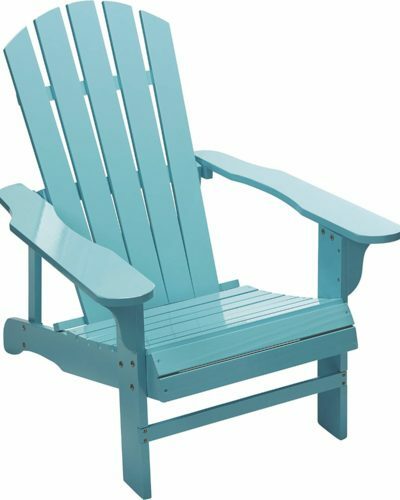 That's a fun pop of turquoise :). Your kitchen looks great as it is, and I saw something on IG yday similar to yours , I will see if I can find it and tag you. And OMG, boat really? How exciting! Thanks! 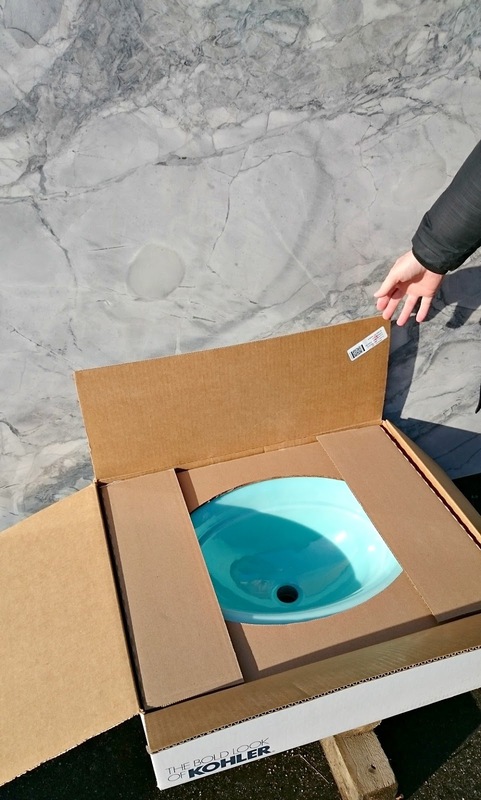 I'm super excited about the sinks. I saw the kitchen you tagged me on – that's such a pretty, sunny space! "I'm not always super particular…"LOL! Looks amazing! I love the counter you chose. So beautiful. And I think you are right about the off centred hole. Hopefully not, but from the photos it looks off compared to the other sink. Hope it is an easy fix! So beautiful and what a transformation from what you began with. 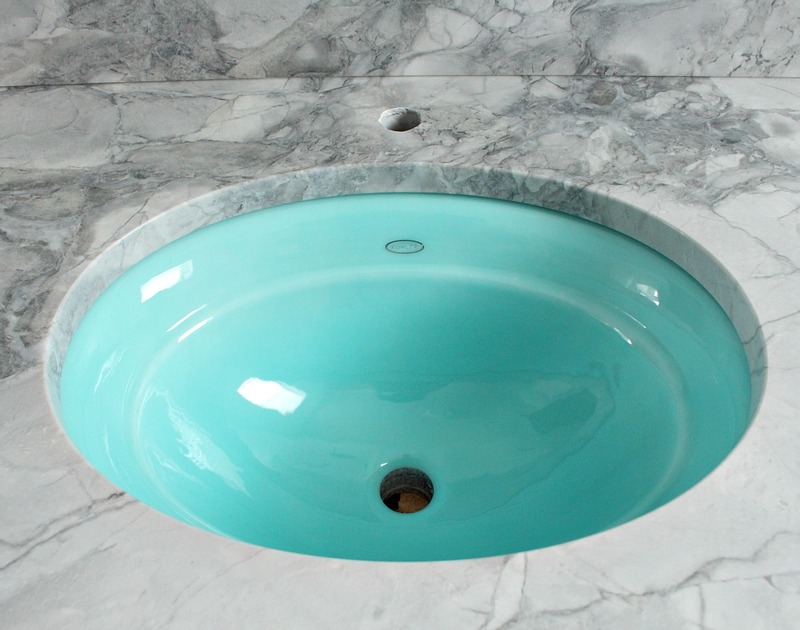 I adore the little pop of color in the sinks. Thank you! It's been such a long time since we tore apart the old room, I keep forgetting what it looked like. 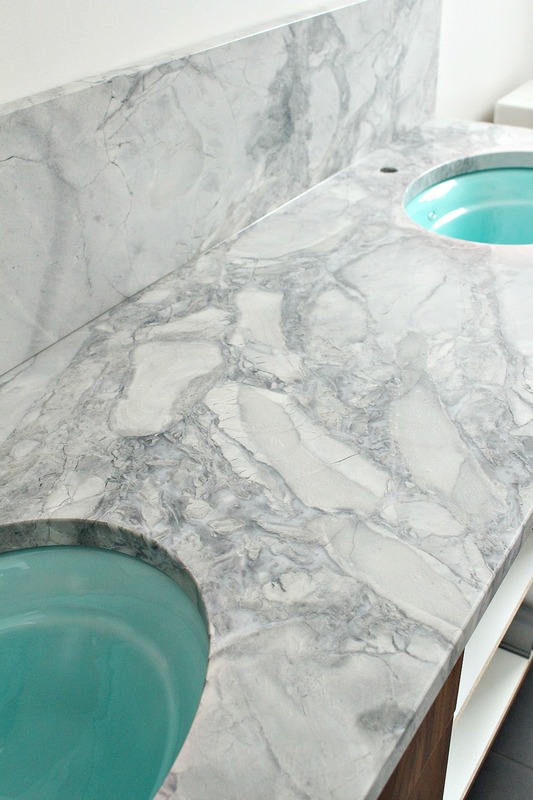 I am so in love with the sinks! Beautiful! Glad it all worked out.. that corner would have bugged me too:) I have the same toilet. Is it wrong to adore a toilet? 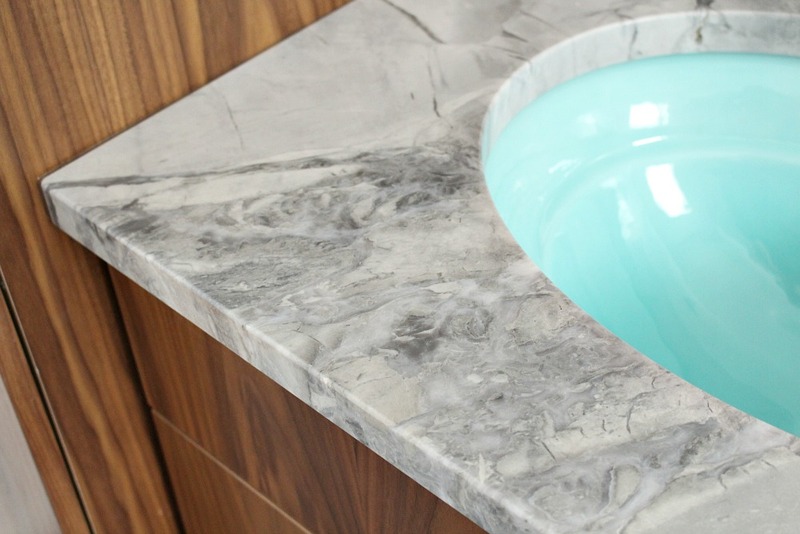 Love the pop of colour from those sinks! My computer is back up and running so back to posting comments lol. I love it, the veining in that counter top is perfection. I also love that toilet, never thought those words would come out of my mouth. I like that there is no knobs on bottom to clean around, it just sleek and clean looking. Can't wait to see it finished. Yay! Happy to hear your computer is running again – that's fun 🙂 Haha, I know – that toilet is dreamy for anyone who has ever had to clean around one! I think cleaning this bathroom will be a breeze, and that makes me happier than it should. Thanks! 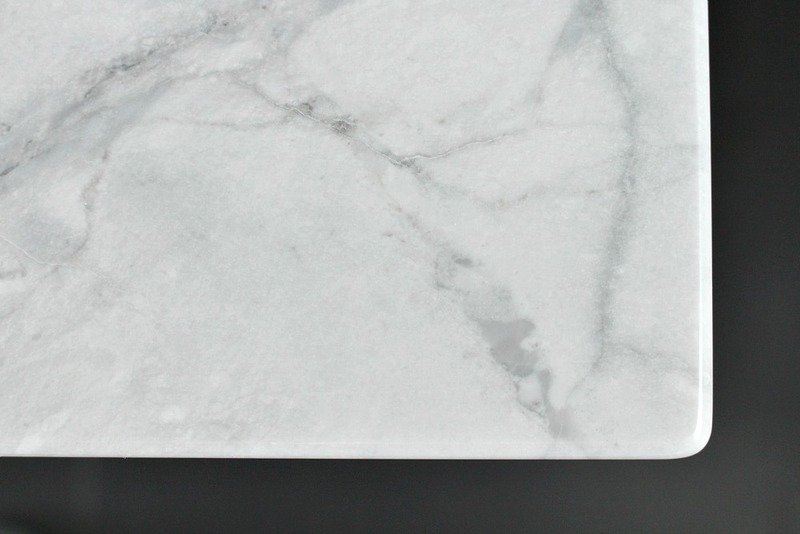 For a second I almost considered a solid creamy white quartz – after I canceled my counter order with the tile shop – but I brought the samples home but I just didn't love any of them. 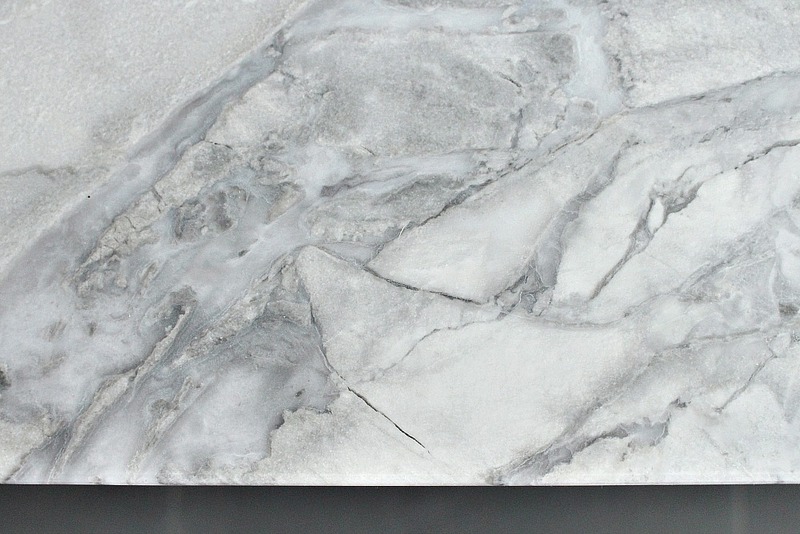 I'm so happy I went with stone – it's quite mesmerizing in person. 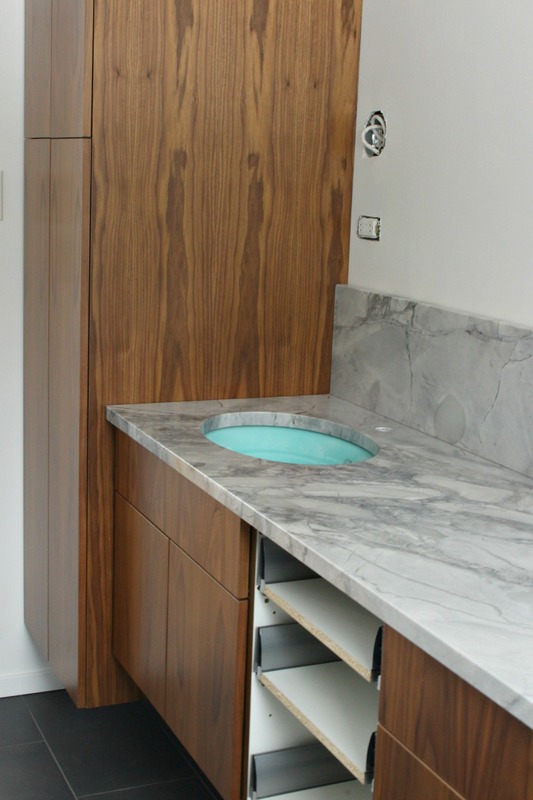 I love how that aqua sink just pops up with that quartzite counter. I can't wait to see the outcome! Thanks! Me too, I'm so excited to finally see things come together – and to start actually using this bathroom for more than baths! That countertop is divine. It looks, like you said, exactly like a frozen lake. Too bad they messed up your corners. I hope they do right by you somehow, and I'm keeping my fingers crossed the faucet hole isn't wrong. Thank you! They have definitely not done anything about messing up the corner – no one even called to check in to see if I was happy. And then they charged my credit card without authorization. Oy vey, BUT, luckily the faucet has some wiggle room so we were able to move it over so the off-center hole doesn't look off-center. Whew! 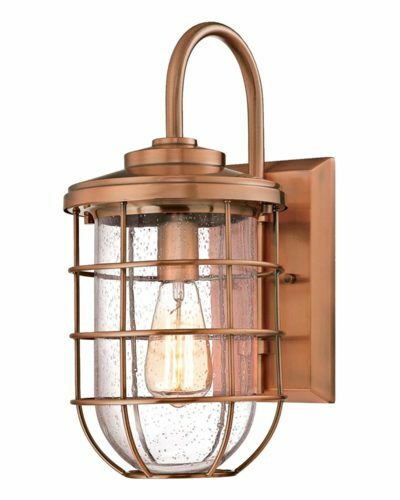 Tanya, Your bathroom remodel is dreamy! On another note, when I use my iPad, the second line at the top of the page with features, my work, and etsy shop– ghost…there is no black background behind them. So they don't show up…until I scrolled over the beautiful dark bathroom tile. Just thought I'd let you know I noticed. Thanks Rhonda! It's getting there, little by little :)That's so good to know about the iPad viewing. I don't have Apple products myself so I didn't realize. I'll have to ask the template designers if they can help me figure it out. Thanks again for the head's up – I appreciate it! 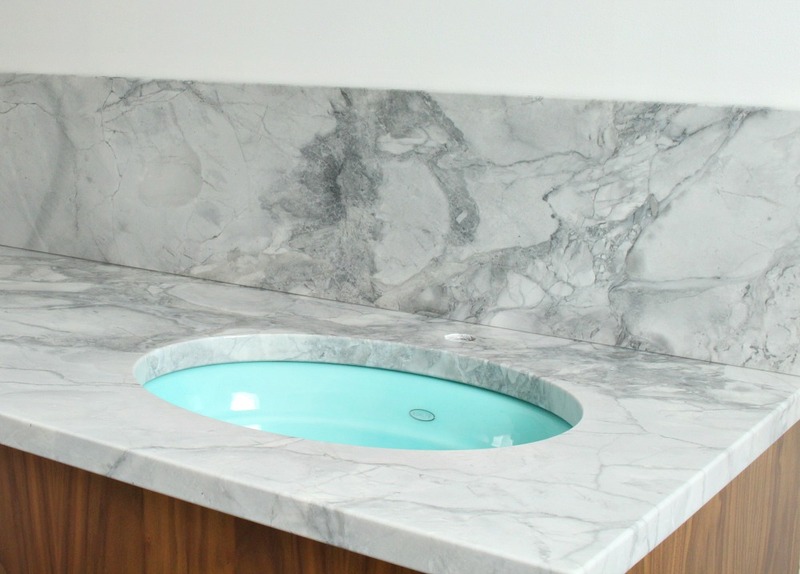 This is exactly the quartzite I want for our bathroom reno!! We are still in the "trenching the slab" stage. Not fun. 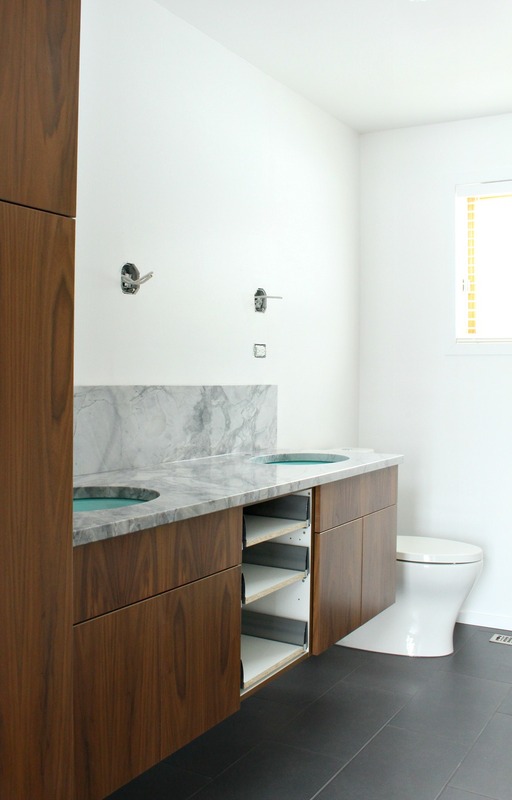 (i have a heading of the bathroom remodel on my blog if you have absolutely nothing to do!) 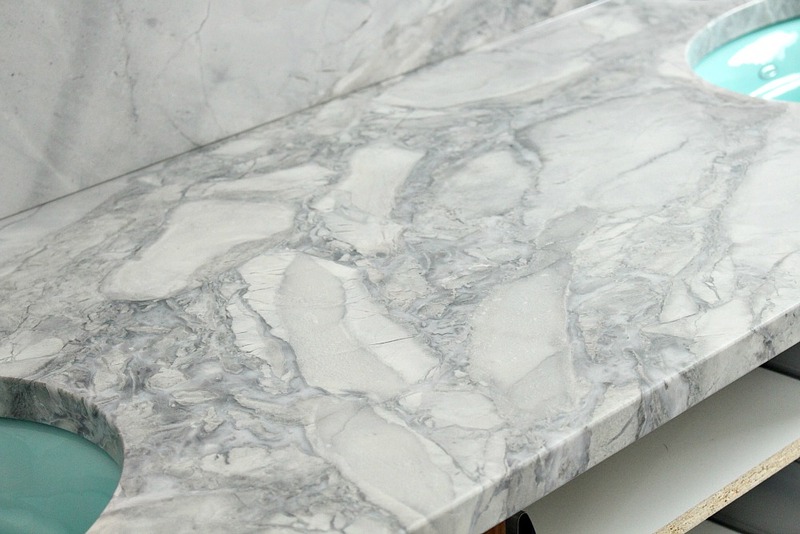 I was hoping to luck out and find a remnant of this countertop because buying an entire slab is such a waste! 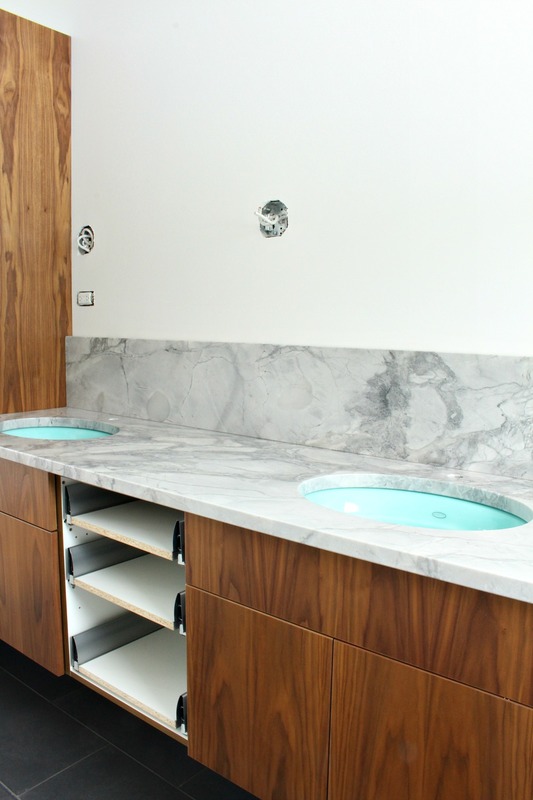 Oh, and love the sinks and vanity you chose too! 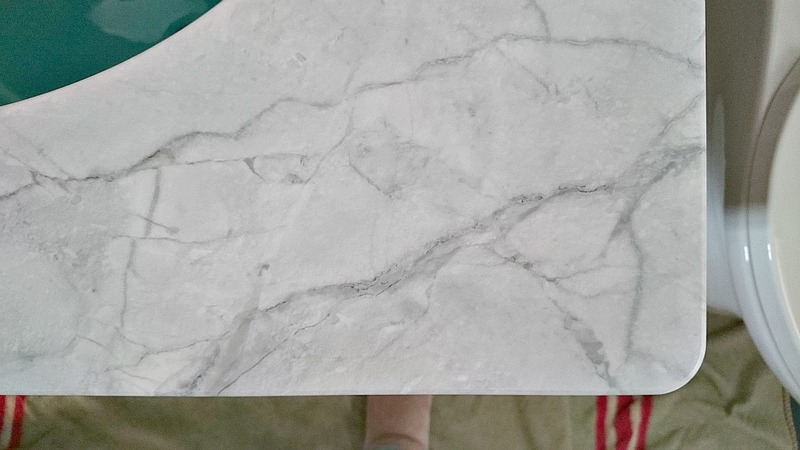 I'm so happy with the quartzite so far. I'm sad the shop buggered up the corners but no one can tell but me. The busy pattern is amazing at hiding water spots and the veining just GLEAMS when the sun pours in – it has so much life to it! I'm really thrilled. Your reno is such a huge undertaking – I'm so impressed. I can't wait to see the finished bathroom!